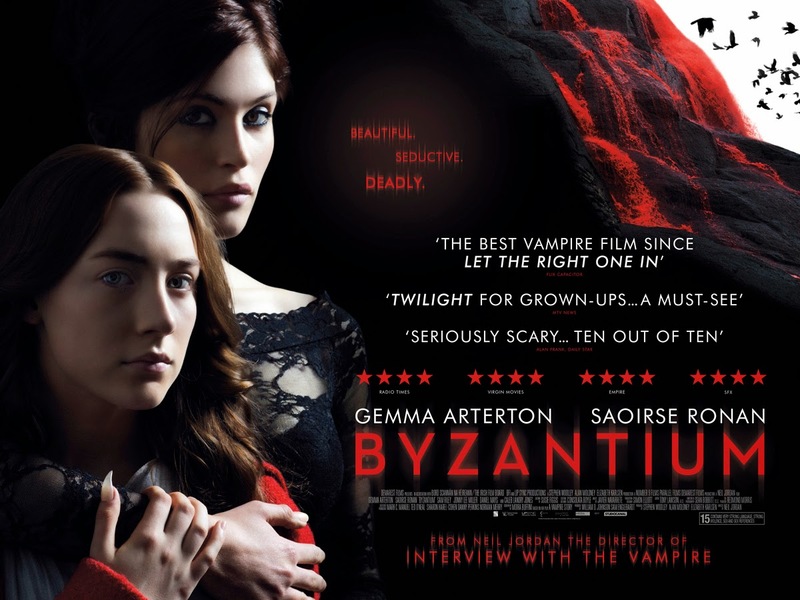 Director Neil Jordan returns to the vampire genre with a little gem titled "Byzantium". The story of Clara (Gemma Arterton) and Eleanor (Saoirse Ronan) it's a gorgeous, dreamy fairy tale. Leaning more towards the Grimm fairy tales, this is the story of two female vampires on the run from a mysterious group of men. As the story unfolds, we learn that Clara has been alive for hundreds of years and her only goal is to keep Eleanor safe from harm. Knowing nothing but the world's oldest profession, Clara quickly finds refuge in a deserted guesthouse, Byzantium, and quickly starts up her own brothel, rescuing the girls from the streets. Eleanor, on the other hand, lives a life of solitude until she meets Frank. The two bond quickly and Eleanor writes the story of her and Clara in order to share her secret with Frank. Unfortunately, Frank does not believe this grand tale of immortality granted by a secret cave behind a waterfall. He refuses to believe that Eleanor and Clara survive on human blood. Concerned, Frank shares Eleanor's story with the head mistress at school. At this same time, the group of men looking for the women is closing in on them. The film goes back and forth between present day and telling the story of how Clara and Eleanor came to be vampires during the Napoleonic Wars. It's a sad story of a woman who has been used and abused most of her life. When Clara finds salvation in immortality and then shares this gift with her daughter, an entire new world of problems opens up for the both of them. Arterton is absolutely stunning playing the tough as nails mom who will do anything to keep her child safe. As always, Ronan perfects the balance between timid and fierce. Just when you think she's going to break, she becomes the toughest character on the screen. Jordan's track record is very up and down, but the man knows how to tell a tragic love story. This is a love story between mother and daughter and men and women. Love is never easy and sometimes it's ugly, but somehow Byazntium tells this never ending tragic story with a deliberate and delicate hand.